The performance is easy to see. The systems, however, are not. Tyco offers a broad selection of concealed detection systems, from wall- or doorframe-mounted antennas to systems recessed into flooring, hidden under carpeting or laid into concrete. 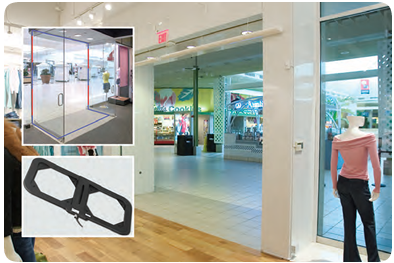 Without impacting store aesthetics, they can protect unlimited width and are ideal for mall-based stores. ALTECH SYSTEMS was incorporated in July 2013 to take over the ongoing Sensormatic retail security solutions business from Bookcourt Ltd trading under Bookcourt Retail Solutions. This is to provide a more coherent approach to our customer base who is looking for a one-stop shop for all retail security Issues. This will also not confuse our customers from our historical book retail business. Therefore ALTECH SYSTEMS providing retail security solutions to our retail partners, is now the authorized business partner of Tyco Sensormatic since February 2012 to provide a complete range of Electronic Article surveillance (EAS) systems on an integrated and scalable platform. With more than 20 years of historical retail experience, we believe that ALTECH SYSTEMS together with the combined expertise of Tyco Sensormatic and more recently InVue Security, are well equipped to provide you with a one-stop solution platform to reduce in-store thefts and increase store performance. Since April 2014, ALTECH SYSTEMS is now the authorised sales partner of InVue Security solutions for Mauritius and Indian Ocean islands. Our solid retailing background gives us a good insight of the retail market and specific local customer behavior. This is what differentiates our company from other local vendors without any good experience of our customer specific retailing environment.